I have become enamored with the British Baking Show Series. The first series to show on Netflix is actually the 5th series of The Great British Bake-off in the UK that aired in August 2014. This difference has caused a lot of confusion for people following the show in the US and Canada. I have watched the episodes many times and finally decided it was time to try my hand at baking. What better way than to follow the series bakes. I am starting with the 1st series on Netflix. The signature bake for this episode was a Swiss roll. Even though it has the title of Swiss, it is generally believed to have originated in Austria. From what I can gather the important thing is to get a soft sponge with an amount of filling that is the same thickness as your sponge. The filling shouldn’t be too thin or it will seep into the sponge and make it soggy. I’m always amazed at the flavor choices of bakers. I love the way Chetna Makan brings her heritage into her bakes which make very different flavor combinations. Chetna made a Cardamum, Pistachio & Coffee Swiss Roll in this episode. Mary Berry commented that the cardamom came through right at the end and liked her swiss roll. Martha Collison made a Tiramisu Swiss Roll with Macadamia nut brittle. I thought the decoration on her bake was very nice. Swiss rolls do not traditionally have any decoration on top, but I think the bare top just cries out for a pretty topping. When making a swiss roll it is important not to cook the sponge for too long. If you bake it too long it will make the sponge dry and it will crack. Many of the bakers rolled their sponge when it was still warm out of the oven. I plan to try this method. 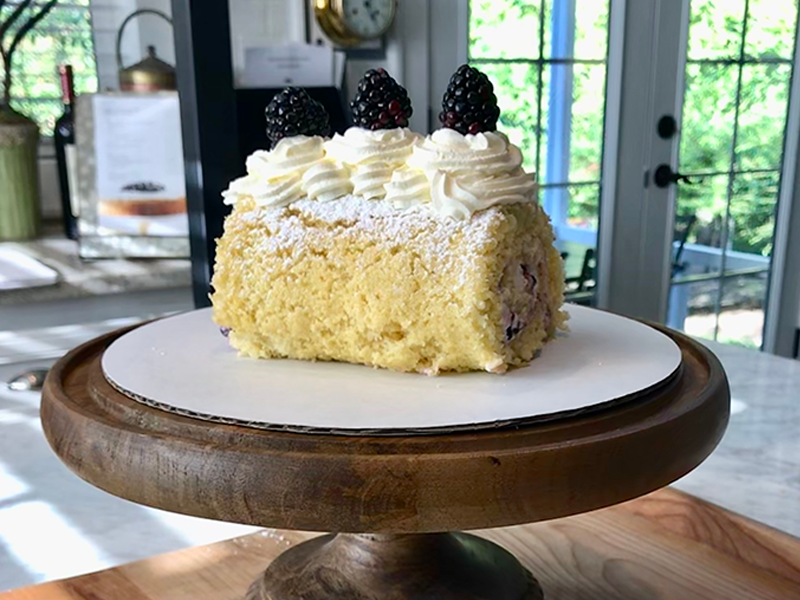 I decided to make a Blackberry, Lemon Swiss Roll. Blackberries used to grow wild in my backyard in Edmonds, Washington here in the US. I think blackberries actually have a subtle, sweet flavor and I believe that the tart lemon will bring out the sweetness in the blackberry a little more. I have a long way to go to learn even a fraction of what the bakers on this show have learned. But I am having a great time. I would love to hear about your version of this classic bake. Preheat oven to 350˚F. Line the bottom of an 18x13 baking sheet with parchment paper (do not grease). Add 5 eggs to the bowl of a stand mixer fitted with whisk attachment and beat on high speed 1 min, or until foamy. Gradually add sugar and beat on high 7 min. It will be thick, fluffy and tripled in volume. Whisk the flour and baking powder together and sift into egg batter one third at a time, folding to incorporate between each addition and scraping from the bottom to catch hidden flour pockets. Transfer to lined baking sheet and bake right away at 350˚F for 13-15 min (mine took 15 min) or until top is golden. Remove from oven and right away run a thin edged spatula or knife around edges of your cake to loosen from the pan. While cake is hot, invert cake face down onto a clean, dry linen towel, remove parchment paper then roll cake into the towel. Let cool to room temp (30 minutes minimum). Meanwhile, combine all ingredients for lemon syrup (water, sugar, lemon juice), stir to dissolve sugar and set aside. In a large mixing bowl, combine 8 oz softened cream cheese, 8 Tbsp softened butter and 1 cup powdered sugar. Beat together starting on low speed to incorporate sugar, then turn the mixer up to high speed for 2-3 min or until whipped, white and fluffy, scraping down the bowl as needed. Add chopped blackberries and stir into cream with mixer on low, just until incorporated. Carefully Unroll cake and loosen from the towel. Brush the top evenly with your lemon syrup. Put dollops of blackberry frosting over the surface and spread evenly. Roll the cake tightly in the same direction you rolled it the first time. Slice off the edges if desired and dust generously with powdered sugar. For the topping, beat together 3/4 cup heavy cream with 1 Tbsp powdered sugar for 2 min on high speed until fluffy and spreadable. Transfer to a large piping bag with a large open star tip and pipe 6 flowers over the top, placing a fresh blackberry and lemon triangle into the center of each one. What a great idea to follow the show by actually trying their recipes.